» Our Adare Clinic has moved! 10 years on and all said and done, a very successful 10 years in Adare, we are moving our business to Limerick City to allow us to expand our dermatology and aesthetics services in the Mid West region. Our clinic in Adare has grown and grown and at this stage, we no longer have the space to meet the requirements of our customers and the staff that currently work at the clinic. 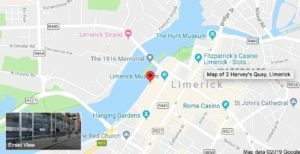 Our new premises, located at 2 Harveys Quay, Limerick is just off the main street, fronting onto the River Shannon. It is almost four times the size of the current clinic and is a purpose built, fully fitted medical centre with multiple treatment and consultation rooms. Looking forward to seeing you in the City.